Nearly 2,100 Huskers — 81 percent of the entire graduating class — participated in the 2018 undergraduate commencement ceremony in Pinnacle Bank Arena. The event was the largest graduation in the university's 150-year history. Starting with spring commencement 2019, the undergraduate ceremony will be split into two events — both on May 4. The change will decrease the length of the ceremony and help meet seating limitations on the floor of Pinnacle Bank Arena. From redesigned gowns to a split undergraduate ceremony, the University of Nebraska–Lincoln is establishing new commencement traditions as part of its yearlong, 150th anniversary celebration. Changes will be integrated into the university’s spring 2019 commencement exercises on May 3-4. Activities open May 3 with the graduate student ceremony, while undergraduates and law students receiving degrees May 4. Starting May 4, all spring commencements at Nebraska will feature two undergraduate events — one in the morning, the other in the afternoon — with specific college assignments for each. The split ceremony will help the university better accommodate growth in degrees awarded and reduce the amount of time graduates, families and visitors have to spend in the arena. “Our traditional spring ceremony has simply outgrown the space available in Pinnacle Bank Arena,” said Annette Wetzel, director of special events for the university. “Last May, we were on the brink of running out of space for graduates, and the ceremony took almost four hours. The dual ceremonies will feature roughly the same number of graduates in each event. The morning commencement begins at 9 a.m. (doors open at 7:30 a.m.) and will include the colleges of Agricultural Sciences and Natural Resources; Architecture; Business; Fine and Performing Arts; Journalism and Mass Communications; and Public Affairs and Community Service. The afternoon ceremony begins at 3 p.m. (doors open at 1:30 p.m.) and includes the colleges of Arts and Sciences; Education and Human Sciences; and Engineering. The split undergraduate ceremony will only be offered during Nebraska’s commencements in May. August and December ceremonies will remain as a single ceremony, also in Pinnacle Bank Arena. Learn more about the split May undergraduate commencement exercises. The other spring 2019 graduation ceremonies are 3 p.m. May 3 at Pinnacle Bank Arena for graduate students, and 2 p.m. May 4 at the Lied Center for Performing Arts for law graduates. 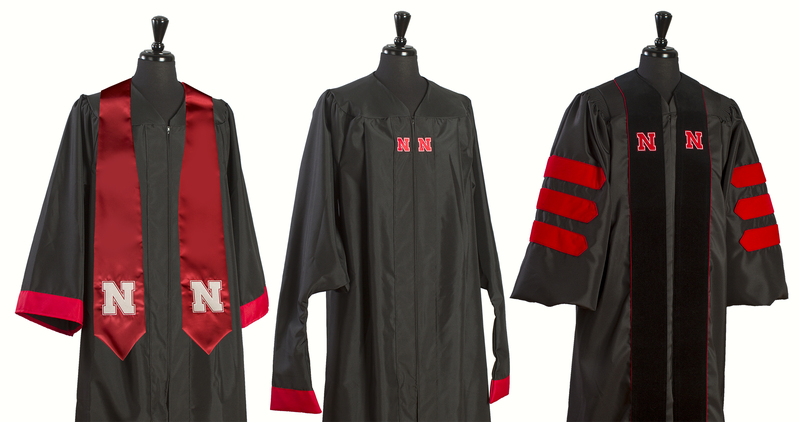 Starting with spring commencement, gowns worn by graduates will feature the Nebraska "N." Gowns shown here are for (from left) undergraduate students, graduate students and doctoral students. Each of the May ceremonies will feature a rollout of updated robes and regalia for Nebraska graduates, administrators and commencement marshals. All robes will include the Nebraska “N” and feature a red and black design alongside traditional colors used for regalia and doctoral hoods. “As part of our N150 celebration, all robes will feature the Nebraska ‘N,’” Wetzel said. “We’re one of the last in the Big Ten Conference to brand our commencement gowns. And, faculty have been asking for this update for years. The updated regalia design will be integrated into all future commencement events. Undergraduates will wear a black robe with red sleeve cuffs and a red stole adorned with two white Nebraska “N” logos. Robes for students earning master’s degrees are black with two red “N” logos along the zipper. Doctoral robes will also be black with three red chevrons on each sleeve and a black stole with red “N” logos. A greater number of faculty will participate in the ceremonies, assisting through the commencement marshal corps. The faculty volunteers lead graduates into the arena, help organize the students by college and answer questions as needed. Wetzel said the marshal corps has increased to nearly 50 volunteers, up from 30 a year ago. The marshal corps will wear robes that are the reverse of the doctoral design — red, with black chevrons. Graduates planning to participate in May commencement activities can purchase cap and gowns during GradFest, April 16-17 at the Wick Alumni Center. After GradFest, cap and gown is purchased at the University Bookstore. Learn more about this event. Other enhancements for the May commencement include updated gonfalons — banners which are carried in by marshals, representing each college — and the addition of the N150 logo to the degree design. The N150 branded degree is only available to 2019 graduates. Additional details about commencement, including speakers, will be announced.